Canadian Financial DIY: Sustainable Investing: Is It OK to Destroy the Economy if You Reduce Greenhouse Gas? Sustainable Investing: Is It OK to Destroy the Economy if You Reduce Greenhouse Gas? It sure is confusing to do the right thing. My most recent foray into looking at what is often called Socially Responsible Investing (SRI), or investing based on Environmental Social and Governance (ESG) factors, started with a recent news item in the Financial Post. Group of 49 ethical funds call for greener oilsands made the interesting statement that "... the current approach to development, particularly the management of the environmental and social impacts, threatens the long-term viability of the oilsands as an investment". That's interesting, I said to myself, at last an analysis that takes the viewpoint of the investor who wants to do right but also to understand the long term investment issues. Alas, the future investment risk analysis consists only of a couple of sentences about aboriginal lawsuits and market access restrictions due to potential low-carbon fuel standards laws in the USA. When I tracked down the original stuff from Ceres (why don't mainstream news sites provide a link directly to original sources anyways? ), the entire content of the press release and document issued by lobby group Ceres is occupied with micro-management - telling the industry what it should do and what its goals should be. Such blatant lobbying with only the slightest veneer of investment content does more to discredit their effort than gain investor support. The trickster feel to the Ceres release was exacerbated by the reference to investors with "$2 trillion under management" and "investments in Alberta's oilsands", which disingenuously fails to say exactly what stake those 49 funds have. Presumably if the oil sands producers are doing a bad ESG job, the ethical funds won't be invested, will they? And if the companies are doing a good job, why do they need Ceres to tell them how to operate at such a micro level? 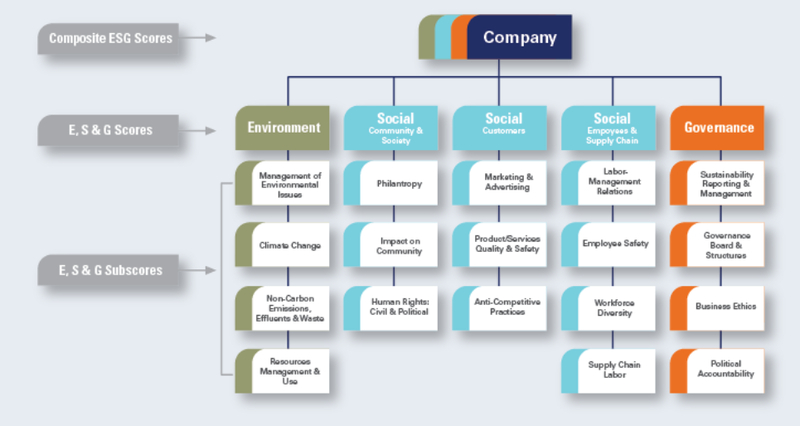 Isn't it curious that the Jantzi Social Index Fund from iShares (TSX symbol: XEN) which buys into "... companies that reflect a higher standard of environmental and social performance", includes among its holdings several notable oil sands companies like Suncor, Imperial Oil and Nexen. Another holier-than-legally-required list, the Newsweek 2012 Green Companies Global Rankings, has Suncor in its list too, as well as another oil sands major Shell (see Wikipedia's oil sands article for others). The disappointment over the oil sands article turned to real cognitive dissonance distress (hey, I paid for my university education so I get to use those lovely buzzwords) when I looked more closely at the Newsweek list. How the heck do all those major world banks get on the list - RBS, Lloyds, Barclays, Citigroup, Morgan Stanley, Goldman Sachs - those fine upstanding institutions whose follies almost tore apart the world's financial system in 2008 and whose miserable economic consequences continue to this day? Is it ok if banks destroy the economy as long as they recycle, have a small carbon footprint, hire lots of women and minorities and get involved in their local communities? It's not that it is necessarily misguided to expect more than obeying the law as the desirable mode of operation from companies. Indeed, a few years ago in the Financial Times, Rob Arnott wrote an eloquent piece called Why poor moral ethics prove costly on the necessity for moral ethics (doing what is right) instead of just legal ethics (doing what is allowed). My objective as an investor is to consider companies holistically. No company is perfect in every way and some things matter more than others. 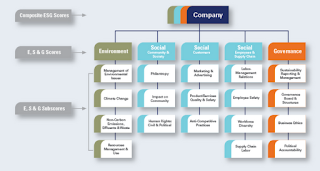 The range of ESG issues shown in the chart image below from index provider MSCI must be considered as a whole. ESG is not enough either. I cannot afford to invest in dud companies that lose money and go out of business no matter what their ESG score may be. A financial and business rating needs to be integrated with the ESG. What I'd want is some combination of the ESG ratings that determine the holdings of ETFs like XEN in Canada or KLD, DSI, NASI and EAPS in the USA (see these ETFs' details on the ETFdb screen for SRI funds) plus an active index methodology like the RAFI Fundamental ETFs CRQ or PXC in Canada or PRF, PXF, PDN and the like in the USA. They could be called "Fundamental Virtue" ETFs. Thanks for another great article. Myself, I think we have woken up to find ourselves in a world where a few who find themselves in power, will happily destroy anything, if they can put a tiny slice of it in their pockets.